// Below was a comment then went on for too long, in response to a conversation sprawled out across a few threads on G+, in response to Jon Lawhead's criticisms of Judith Butler in light of having recently received the Adorno Prize. Of course I agree with you, Jon, that packaging matters; my argument is that this fact alone doesn't give much direction for evaluating some particular packaging. The only justification offered in defense of your objections has been admittedly grounded on pure ignorance, which is clearly not suitable ground for drawing policy or funding decisions. If all it took to convince you of the worthlessness of some text is a single rambling or incoherent sentence, then virtually all of science and literature would go down the drain. A few days ago I was struggling with the math in a paper, and John Baez helped me parse it, while still admitting some important notational (that is, packaging) difficulties.Sometimes you have to scavange for the good bits of knowledge, and it isn't always easy. Your complaints about Butler's packaging go no deeper than to show that you aren't willing to do the work to harvest from the results. Its reasonable enough to want others to do it for you, or at least tell you why its important, but when they do by awarding her a prize for the work, you complain that the prize is illegitimate. Its a completely failed position. The fact that you (and your communities) don't find the packaging useful (yet) doesn't mean that other communities haven't found a use where the work has importance and possibly foundational meaning. Human brains aren't particular good at thinking clearly, but they are really damn good at doing the best they can with what they have available, and then making that best work available for others to improve upon. In this way Critical Theory is no different from any other human endeavor. 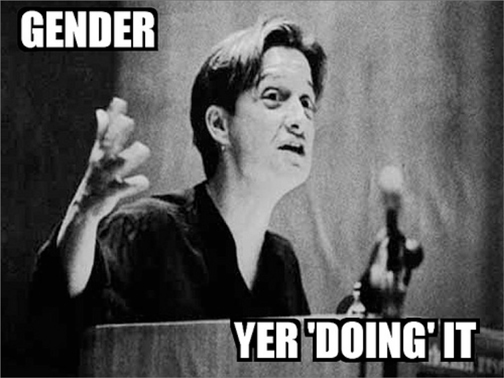 Butler in particular has achieved something like the status of an icon in gender studies, and has become a source of inspiration (if not insight) for many human beings struggling to come to terms with their identities (gendered or otherwise) in light of their extraordinarily complicated cultural contexts. The gender movement has rallied together to enact historical change over the last few decades, and scholars like Butler have played no small roll in its successes. Given the literature we are discussing, calling such thinkers "conceptually confused" is quite amazingly insensitive to the real conceptual difficulties that govern the dynamics of existing social institutions. Arrogantly asserting from the outside that there are clear and straightforward solutions to these problems, and moreover that it is the fault of their community for exacerbating the problem is downright insulting. This is why I'm importing the jive talk and other racial examples, because these are the same problems. These are identity problems, and it is clear that your approach to them is just dead wrong. But this isn't merely an opinion of mine, and I would like to be able to convince you its right. That's hard, because if I'm right that means that things get worse for you, because there's a lot of real work that you've up to now completely ignored. If I'm right, it means your proud refusal to engage that work is completely unjustified. Not that you'd have to read it, but you'd no longer be able to proudly self-identify as the historically ignorant person you are; hopefully, you feel a little ashamed of yourself as a result. Louie C.K. says "I've been having some trouble sleeping at night, as we all should." There are much easier things in this world that convincing a white middle class ivy-educated heterosexual male that there might be identity problems he wouldn't understand, but that's the task before me. So here's a neutral example: take the use of language. A traditional view, one that you seem to be espousing, is that there are optimal and suboptimal ways of using language, and that we should discourage the suboptimal ways and encourage the optimal ways. Choose whatever standard of optimality you'd like: compressibility, expressiveness, throughput; there are optimals to achieve, and we should try and shape language to tend towards those optima. On this view, you might see kids on the corner repeating some localized, community-specific phrase with very little information content, but repeating it often enough so that it appears in the network activity a disproportionate amount of the time. "Know what I mean?" or "that's what she said" might be good examples of this kind of linguistic tick. The repeatedly generated copies of these memes in the network might be taken as a sign of suboptimality or inefficiency. On the traditional view, we might want to look for ways to eliminate these redundancies and better optimize the language. The traditional view thinks: Get the kids to stop speaking that corrupted slang language, and have them speak proper, clear Engligh, and it will not only improve their language use, but it will improve their chances for success in the system. In other words, its in their interest to adjust their culture to suit our standards! Hopefully the analogy to the arguments you've put forward is clear enough, and you see how silly the view is. If that isn't convincing, let me use a closely related example. Dunbar suggests that a self-organized network near Dunbar's number will be spending about 40% of its time on social grooming behavior. If the goal of social grooming behavior is to get groomed, you might think there are optimal ways to groom a community, and you might see the time and energy wasted on more passive social grooming techniques as suboptimal. "If we want to brush everyone's hair", you shout, "We should send them through a bank of hair-brushing machines in parallel! We'd be done in 20 minutes instead of four hours! And we wouldn't waste all that time on mindless gossip and chatter!" But this is obviously a mistake. The goal of social grooming is precisely to spend that time gossiping and chattering. If you try to optimize it for just hair-brushing, you miss out on the whole point of the process; although the system now has brushed hair it is yet completely ungroomed, and whatever social benefits accrue from the grooming process will be almost entirely lost. Social grooming takes a lot of time and resources, and as such allows gossip and chatter to develop as functional parts of the group dynamics; if you get rid of the chatter, you effectively get rid of the group. With the kids on the corner, your attempt to eliminate their colloquial protocols and replace them with your proprietary standards is likewise a way of eliminating the target culture. Remove the linguistic ticks that helps the group self-identify and you eliminate the group, in want alternative methods for self-identification. In other words, by saying that she is "unclear and obscure", you are effectively saying "she is part of a sub-community that I don't identify with and (hence?) I don't think should exist". You are saying that she shouldn't talk like that, even when talking like that is partly what sustains the communities she identifies with. In the racial cases, this is something close to the suggestion that black parents should not give their children distinctively black names. Yes, such names might objectively weaken their opportunities in the surrounding communities, but those aren't the communities that are informing the choice of a name, and they aren't trying to optimize for them. Okay, you might grant the analogy and still think that there are some reasons for eliminating some linguistic communities and promoting others. Hate speech communities are a pretty easy example, perhaps obscure post-structuralist philosophy is another. But before we start putting linguistic communities on the chopping block, what should be our global standards for which communities live or die? You've cited clarity and productivity as constraints, but clarity and productivity by what standards? By _whose_ standards? This kind of top-down engineering has me suspicious, even assuming you can give universal standards for clarity and productivity (you probably can't). Before we shoulder the task of literally deciding which communities live or die, perhaps we should be looking for more natural footholds into the dynamics of language and community. After all, languages are born and die natural deaths many times without systems-level engineering. Languages are typically born through the activity of the rising generations in mixed-language and mixed-cultural environments, who develop new symbol systems in order to cope with situations and communities that the parent languages weren't able to solve. Languages die when they become obsolete: that is, when they fall out of use. Managing linguistic communities is a matter of managing language use over the lifetime of the community. So how do we manage use? Education can provide a positive feedback loop that encourages and promotes certain standards of use (and make no mistake, Critical Theory is an instutitional discipline that does have standards! ), but are aren't talking about just encouraging good use, we are talking about eliminating bad use. Obviously shooting abberrant users in the face, or subjecting them to prison or "reeducation" or other forms of punishment and coercion aren't options, and probably wouldn't be effective anyway. The suggestion I prefer is to let the system self-organize, and let the users decide for themselves what languages to use and what communities to identify with. If the people don't care enough about some language community to ensure its thriving success, then let it whither from lack of use. I'm not suggesting that you can't manage the system; I'm saying that the kind of management should err on the side of self-organization. Allowing the system to self-organize involves providing feedback about general features of language use at the systems-level, and letting autonomous users incorporate that feedback into their patterns of use. Perhaps getting feedback about the amount of hate-speech in language might be enough to nudge people into changing their linguistic behavior. Maybe informing users that there is a linguistic community on the brink of extinction might spurn new engagement with that language and revitalize that community; or maybe it will make everyone understand that it is timer to move on, so they can at least prepare accordingly. Giving people feedback about their patterns of use and its consequences is, I think, just about the only systems-level features you have to design for; with appropriate feedback, the system should self-organize into stable patterns without having to make systems-level executive decisions. One part of your complaint against Butler I have some sympathy for is the insular nature of the discipline, and hopefully thinking carefully about feedback will help to break down those walls. But notice that feedback loops for controlling self-organization does not require that we specify in advance any kind of standards for clarity or productivity or whatever. We don't have to have those standards in hand when we design the system, and none of the individuals might ever be able to specify or identify when some instance of use counts as "clear" by some objective measure. Allowing the use network to self-organize means the network will solve the problem as a whole, even if none of the nodes can. The upshot is that, when we have the right kind of feedback in the system, then no one gets to complain about what communities and patterns of use individual users subscribe to, because there is no systems-level vantage point from which to make that decision. In other words, let the languages alone to live and die as their communities see fit. Instead, one can only complain that the available feedback is insufficient for adjusting patterns of use. In other words, instances of poor use become _systemic_ problems, and cannot be hoisted onto the individual nodes. If she's unresponsive to feedback, that's because the feedback isn't doing its job. I'll lose by saying that Butler's work is not obviously insular in this sense, and she's made a good deal of progress in clarity and scope over her decades of work. Undoing Gender was a much easier read than Gender Troubles, for example, and the adjustment in style is undoubtled influenced by the feedback (both positive and negative) she received in the interim. Butler certainly isn't working in a vacuum, but is situated right smack in the middle of the torrent of bubbling cosmopolitan activity.